In spite of many political and economic uncertainties as well as numerous business challenges ranging from the lack of skilled personnel to digitalization, the logistics industry is confident that it will meet the challenges. Companies are getting ready and pushing future technologies forward. This can also be seen at transport logistic in Munich from June 4 to 7, 2019. 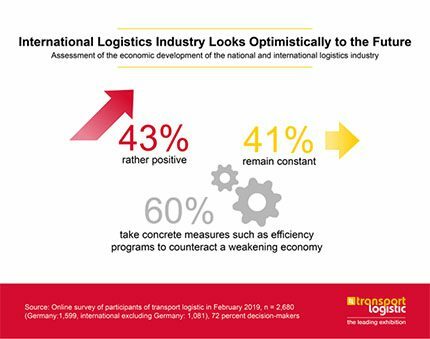 “The international logistics industry is optimistic. Forty-three percent of the logistics professionals surveyed see the further economic development rather positively, and 41% believe it will remain stable,” Stefan Rummel, Managing Director of Messe München, reported. “At the same time, the trend barometer of transport logistic shows that companies are facing the challenges, adapting and investing in future technologies.” The opinion research institute IfaD conducted the survey online among previous trade fair participants on behalf of transport logistic in February 2019. Seventy-two percent of the 2,680 respondents are in managerial positions. Despite many economic and political uncertainties, logistics professionals in Germany (1,599 respondents), other European countries (868) and beyond (213) see economic development globally and in their respective countries as rather positive (43%) or stable (41%). They feel ready to face the challenges. Sixty percent of companies are taking measures such as efficiency programs to cushion a possible slowdown in the economy. In addition, 61% say they will adjust their supply chain or do so in the near future due to stronger trade conflicts and punitive tariffs. 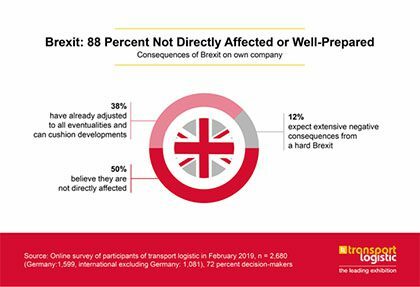 Even in the face of the Brexit chaos, the majority of respondents are not worried. Thirty-eight percent say they are prepared for all contingencies. Fifty percent believe they will not be directly affected. Only 12% fear massive adverse effects from a hard Brexit.